In this issue...all-new tales of terror in the Warren tradition. Featured artists include: Frank Frazetta, Neal Adams, Rich Buckler, Alann Weiss and more! Just like the old Creepy Magazine! A black and white comic magazine with color cover. Great horror stories with great artists like: Bill Black, Jim Webb, Jason Paulos and more. Writers include Don Glut and Artie Godwin. Cover by Sanjulian. The ol' Creep is back! The best in illustrated terror and suspense. Looks and feels like the old CREEPY magazines. Features many talents from the classic horror comics like Val Mayerik, Don Glut, T. Casey Brennan and more! Cover by Ken Kelly! Just like the old Creepy Magazine! A black and white comic magazine with color cover. Great horror stories with great artists like: Pablo Marcos, Jason Paulos, Mike Dubisch and more. Writers like Don Glut and Artie Godwin. Cover by Frank Frazetta. The ol' Creep is back hosting the mag! Just like the old Creepy Magazine! A black and white comic magazine with color cover. Great horror stories with great artists like: Richard Corben, Jason Paulos, Peter Cacho and more. Cover by Basil Gogos. The ol' Creep is back hosting the mag! Just like the old Creepy Magazine! A black and white comic magazine with color cover. Great horror stories with great artists and writers in this issue: Kenneth Smith, Alex Nino, Don Glut, Nicola Cuti and more. The ol' Creep is back hosting the mag! In this creepy issue: Historic Horrors and some of the weirdest horror comics around. In the tradition of CREEPY and EERIE magazines. Writers include Don Glut, Neal Adams and Artie Godwin. Art from Ralph Reese and many more greats. Cover by Frank Frazetta! Don't miss this one! Just like the ol' days of CREEPY and EERIE, the tradition creeps on with THE CREEPS magazine! Rich Sala pulls together another horror-filled mag of black and white comics, you mom would be happy to throw away! Rich Corben is here along with Warren originals Sanjulian, Don Glut, Nocola Cuti and more! 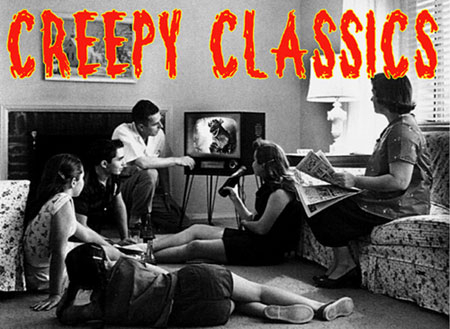 It's here....THE CREEPS at Creepy Classics! This issue features a monstrous cover by Ken Kelly, plus Neal Adams and Don Glut inside. Vampires, werewolves, zombies and giant monsters challenge your fears. It's just like the old days of CREEPY....THE CREEPS. Black and white horror comic mag. Frazetta is back! A great cover by the iconic Frank Frazetta. In the fashion of the great black and white horror comic magazine, it's THE CREEPS. Historical horror, werewolves, space terror and more! Writers include Don Glut, Nicola Cuti and Artie Godwin. Get THE CREEPS now. In this horrifying issue: Dracula Returns, Shades of Dorian Gray, The Devil's Hand, Invisible Horror and more. In the tradition of CREEPY and EERIE - Black and white horror comic mag. Artists include: Sanjulian, Nik Poliwko and Benito Gallego. Writers Don Glut, Nicola Cuti and more! It's like you're back in the 1970s again with CREEPY or EERIE magazine! This great black and white horror comic revival is engineered by publisher/editor Rich Sala. This issue features a classic Ken Kelly painting. Jungle horrors, Frankenstein, Spook Show horror...loads of creepy, fearful fun! Just like the old CREEPY and EERIE magazines...a great, retro black and white horror comic magazine. Cover by Frank Frazetta! Includes The Mummy Walks, Zombies of the Mardi Gras, This Gun For Horror, The Scarecrow Man and more. Get creeped out now! Wow! The Best of THE CREEPS! A large square bound collection of classic black and white horror comics in the tradition of CREEPY and EERIE magazines. Beautifully done. Ghouls, space horror, vampires, Medieval terror. Get shocked with this first annual from THE CREEPS.